As some of you may have the problem sleeping, or sleeping related back/neck pains, that constantly haunts your every single night. You may or never have noticed that the problem are generally came from your beloved pillows. A good or firm pillow can make your night sweeter, comfortable, without disturbing your sleep, and fully replenishing energy for your next day. A bad pillow doesn’t just ruin your day, but also make you feel more tired the next day, and therefore affects your work efficiency and performance. As mentioned on the video, one common sigh of bad posture caused by pillow is known as sleep apnea. It’s a sleeping disorder whereby a person’s breathing airway get restricted or paused. The common symptoms are choke-sleeping or loud snorting during the sleep. Even worse, that can affect sleep quality as well as the sleeping partner’s, and eventually having difficulty to get into deep sleep. If you already having this issue, a good pillow may has adverse or prevent this kind of problem that distressed your family member or partner. Here is the Youtuber Matt from his channel “The Deal Guy” comparing, in his opinion, the best pillow out of two totally different type of pillows in the market. 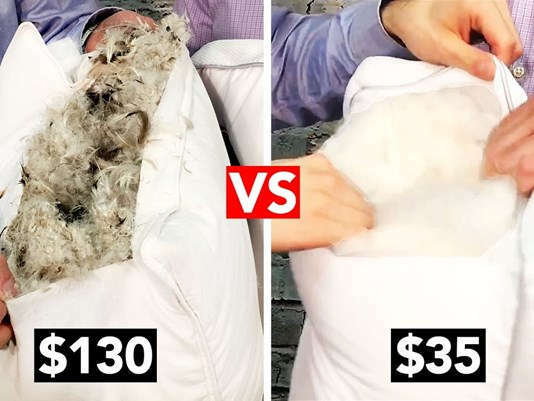 One on the left is the expensive down filled feathers pillow while on the right is the modern spring pillow. The comparison is single-sided as the modern pillow are scientifically firmly designed to prevent any blockage of throat airway, and have a smoother passage. Therefore, avoiding pause breathing and relieve long-term snoring. Also in favoured of customer, the price is surprisingly 4 times lower than its counterpart. On the other hand, down filled feathers pillows are luxurious and expensive pillows that usually filled by goose or duck feathers. As we may know that those down filled pillows are not for everyone, as some may have allergy reaction towards the furs or feathers. Even sterilised, those micro feathers/fur can still passing through the small openings to continue hunt your nights. Also, in compare to inorganic man-made fibers, these organic fibres are prone to infectious parasites such as fleas. If you’re interested, below is a comparison table of our hand-picked best spring bed pillows that loved by everyone (more positive reviews). By comparing the price and quality, we may have found one that suite you the best.